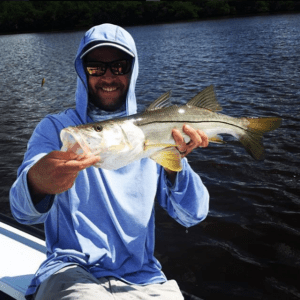 January in Southwest Florida is the dead of wintertime, and so far in 2018 we have had a bit of cooler weather than in recent years- but it’s still South Florida, and well – we’re still fishing! We thought we’d drop a line about what to expect in the inshore waters of Naples specifically during this month, and so – continue below to see what is providing us the hot bite! 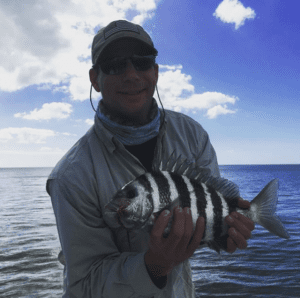 Fishing for sheepshead here in Naples during the month of January is one of the best times to target these guys. Usually peaking from October all the way through to March, January puts us dead center of prime fishing season for these guys. On the fly rod, this time of year is going to be your best bet on checking this species of your bucket list. However, this species is also one of the most difficult to get to take your presentation. On the shallow flats it can take dozens of attempts before you entice a strike, but around structure, they seem to let their guard down (become a tad less picky) when it comes to downing your fly. You generally want to use a small imitation crab fly for these guys, and maybe consider switching up to a shrimp pattern – the day will dictate this. Much like the sheepshead talked about above, January in Naples is the dead center of black drum fishing season in these waters. Unlike sheepshead, fly anglers will be looking at great opportunities to hook up with these guys. 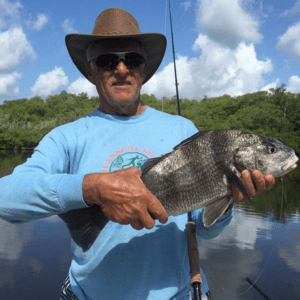 Getting a black drum on the fly is a lot less challenging than sheepshead, however – spotting black drum on the flats can still be hit or miss. However, when you do spot them, you have an excellent chance of getting a hookup. Fly selection can be a little more diverse as well. The biggest factor when fishing for black drum on the fly is to remember that they are true bottom feeders. While you can use a diverse selection of patterns, they have to be able to sink and work along the bottom. One last key to January black drum in Naples is the accuracy of the cast. You have about an 8 or 10-inch circle to hit, to get this tunnel-visioned bottom dweller to even notice your presentation. 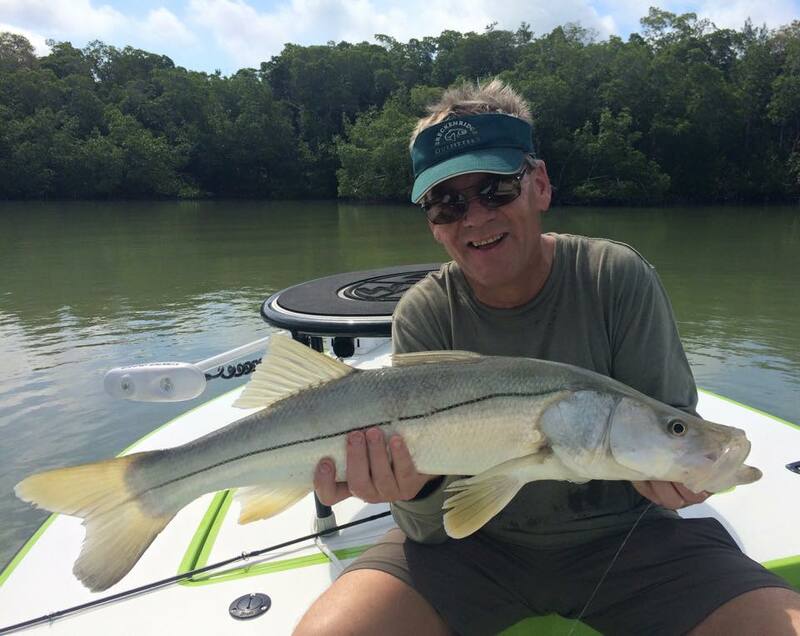 As far as a Snook fishery goes, Naples is one of the best. In this, we are able to target these guys most all of the year. But I’d be a liar to say January was prime time. That said, fishing for snook during this time of year can be good. The biggest deal for January snook will boil down to water temps. When we get ht with a cold front, these guys will generally shut right off. You can still spot them, but you can almost bounce a lure off their head just to watch them slowly turn and get away from your temporary annoyance. However, when the front is gone and temps begin to rise (even just a hair, but more is better) they come right back to their regular aggressive selves. Your best bets on fly or artificial lure of any kind is a suspending bait, with a twitch action. Twitch speed will be determined by how the fish are reacting. While in warmer weather a topwater can be a great choice, your only chances of getting a topwater strike in January is to catch them being in an aggressive state at the time of the cast. Busting bait for instance. But even in this case, suspending lures will work just as well – so I suggest just to leave that tied on for this time of year.